Bretagne Brittany One of France’s most rugged regions, Brittany is a fascinating mix of spectacular coastline, ancient towns, magical islands and inland woods. Hotel Ambassadeurs Brittany France Accommodation. 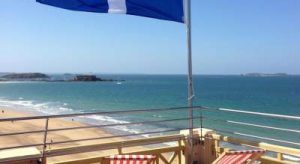 Located on the seafront in Saint-Malo, the Hotel Ambassadeurs is just 800 metres from the town centre and the TGV train station. There are 3 people looking at this hotel. More It offers direct access to the beach and a 100 m² rooftop terrace with a panoramic sea view. All rooms are serviced by a lift and equipped with a TV and a private bathroom. Some guest rooms also have a private balcony that overlooks the sea. Hotel Ambassadeurs has a bar and free Wi-Fi is available throughout the property. There is also an on-site crêperie, which serves a variety of home-made dishes. Guests can discover Brittany’s Emerald Coast and the Ambassadeurs is just a 5-minute walk from the Thermes Marins Spa. Free public parking is possible on site and private parking for cars or for motorbikes are available, upon reservation when booking. 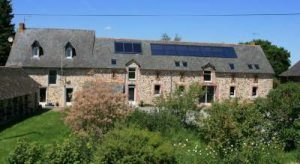 Biologite is located in Argentré and offers guest rooms and an apartment set within a working farm with animals. You can visit the farm, buy organic produce and fish in the private pond. More With exposed beams, the rooms have a garden view and a private bathroom with bath or shower and free toiletries. Breakfast is included in the rate and served each morning in the dining room. The 2-bedroom apartment also includes an equipped kitchenette where you can prepare meals. Wired internet is available in public areas and BBQ facilities are also provided on site. The property offers free private parking and Rennes Airport is 45 km away. Stone Villa In Sainte-Barbe/ Plouharnel offers accommodation in Plouharnel, 37 km from Saint-Barthélemy. The property boasts views of the garden and is 30 km from Vannes. The kitchen features a dishwasher and an oven, as well as a coffee machine and a kettle. A TV is offered. There is a private bathroom with a shower. Quiberon is 14 km from Stone Villa In Sainte-Barbe/ Plouharnel, while Lorient is 23 km away. Take A Break Holidays takeabreakholidays. Bretagne Brittany Accommodation.